The next beach around from the famous Doyle’s of Watsons Bay pub and seafood restaurant is a rather interesting spot called Camp Cove. 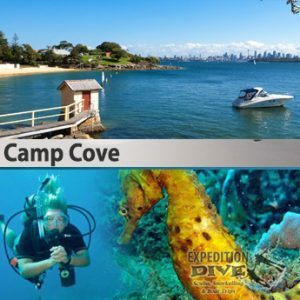 Famous for being the location where members of the colonising First Fleet camped for their first night in what has become Australia, Camp Cove is one of the more expensive beach areas in Sydney. 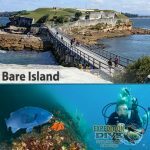 A protected bay inside Sydney Harbour, Camp Cove is popular as both training location, a standby dive site when all else fails and as a night dive. In fact, I made my first two training dives in Camp Cove, and still enjoy getting back there when the opportunity raises itself. I find it to be an excellent dusk and night dive, with a seriously easy entry and exit. There are three areas commonly dived at Camp Cove – the Eastern End, the Western end and the middle reef. 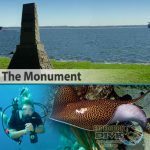 The two ends are dives around the walls that make up the peninsulas, while the middle reef is a flat reef in between the former two. For mine, the Eastern End is the most interesting most of the time. At day time, Camp Cove is best suited to a training or refresher dive, or a standby if all else fails. Visibility can be limited (5m is good), and there are many other great sites close by. Its at dusk and night time when Camp Cove comes into its own. Its at this time that the site can be very interesting, and very productive for the photographer. Sea horses, pipefish, octopus and squid make regular appearances. It is a great muck dive, and we easily find ourselves spending over an hour on a dusk dive here. The only cautions with this site involve parking (its hard to get in the day, and the car park is a little dark and isolated in the evening), boat traffic (recreational boaters love this spot) and fishermen off the point. Its also best to avoid diving Camp Cove (along with many Sydney Harbour sites) after extensive rain – it may be a little polluted. 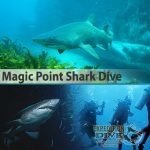 A great dive – enjoy! The biggest attraction at Camp Cove is the seahorses but other aquatic life includes blue grouper, moray eel, crimson wrasse, cockatoo fish, sergeant baker, roughies, bullseyes, white ear and more octopus & cuttlefish. Over the years many glass antiquities have found themselves in the Cove – find time capsules such as old school beer bottles, beautifully blown blue medicine bottles as well as modern day treasures. Heavy boat traffic – always ascend with one arm extended and looking skywards. When heading towards the South Head, prepare for sudden surge, swell and even white water as you approach the open ocean. Watch for fishing lines – particularly around the wharf.